Mt Fuji’s 1/2 price sushi night! My friends and I decided that we haven’t been to Mt Fuji’s in a really long time, and so we decided that tonight was perfect because on Thursdays from 5pm-12pm, all sushi is half price – which is great because I can order rolls from any price range without worrying about price overlap. Today, I decided to try the simple Unagi roll (BBQ eel with cucumber) and Running Rebel roll, which consists of white fish, white tuna, & salmon, topped with yellowtail & scallions. It was very light – I wish that the yellowtail could have been more fresh; I think it would have made this roll spectacular. The Unagi roll had just the right amount of eel sauce, and I really enjoyed that (but then again, I think you’ve realized by now that I just love eel). So, once again, after comparing Mt Fuji’s 1/2 price sushi with Sushi Love, I decided that Mt Fuji comes out on top. I had said earlier that Mt Fuji’s ingredients had lacked freshness, but I think it has improved again since my last remark. 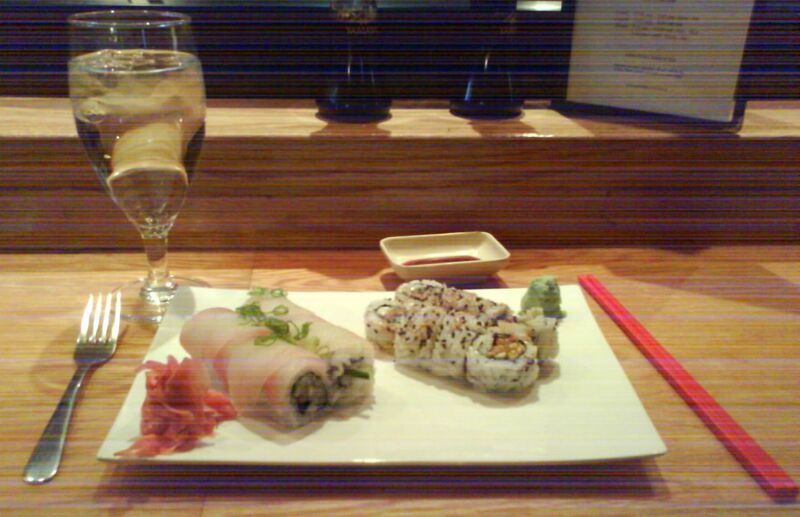 In my mind, however, nothing still compares with the creative rolls of Shiki Sushi.. that’s still a difficult one to beat. I’m not sure how the same owner can manage to make the rolls at Sushi Love and Shiki taste so differently! Thanks for the awesome templates, I’ve been looking for a long time and these themes are what I really like to use for my blog.